Cushions.. Made from pastry! Genius. This evening, we had pies for dinner. Round pies. Cutting round pie-lids from square pastry involves pastry offcuts. Delicious pastry offcuts. This is the edges, cut into squares, placed into a woven lattice arrangement, brushed with butter, sprinkled with sugar; and baked in a 200C oven for about 15 minutes. It’s a little bit on the bland side, though; but well suited to eating with ice-cream. Mille Feuille has to be among my favourites to cart out of the kitchen – it’s… impressive to look at. 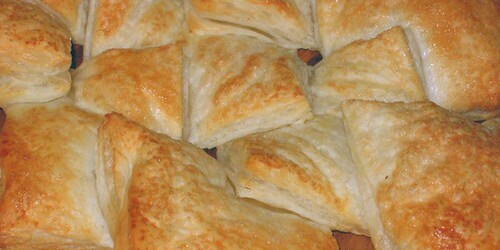 Usually, Mille Feuille is made with puff pastry; however the recipe I use (http://www.cuisine.co.nz/index.cfm?pageId=27734, uses filo/phyllo instead. I understand that the name Mille Feuille roughly translates to “Thousand Layers”; and also that one can make a savoury Mille Feuille, traditionally using fish.